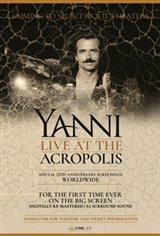 Yanni: Live at the Acropolis celebrates the 25th anniversary of one the most popular concert films of all time! Yanni's astounding 1994 performance with his own six-piece band and the Royal Philharmonic Orchestra is digitally remastered in full HD and available for the first time on the big screen. In addition to the concert film, there will be an exclusive screening special introduction by Yanni.